Once the above are entered, the machine will auto set, and carry out machining automatically. It will alter setting if it encounters poor cutting conditions, and revert once they are cleared. 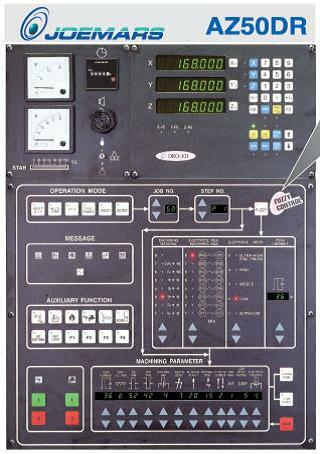 The fuzzy logic control system is a basic form of adaptive control it monitors the important machining parameters. If the machine encounters a problem whilst cutting, the parameters are automatically adjusted until the problem is cleared, then the control will revert to using the original settings. Programmable Z axis – 50 programs which can be a single step, or up to 10 steps. 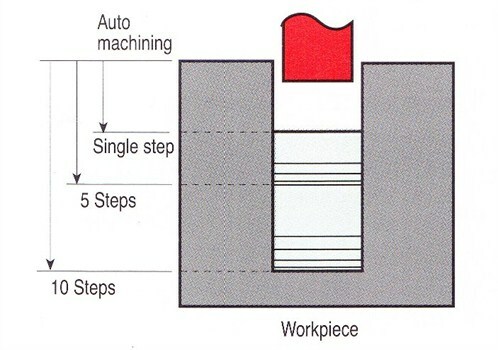 Each step can contain 12 different machining parameters. The machining parameters can be modified at any time during cutting without affecting the stored program. 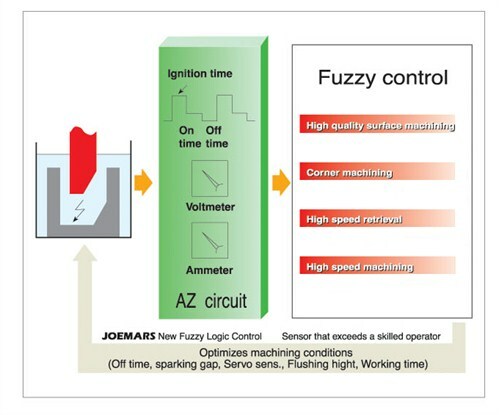 Using the fuzzy logic control system, most users have seen considerable improvements in machining time, surface finish, especially when machining thin ribs, and electrode wear rates.